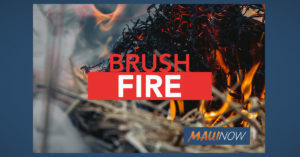 An estimated one acre of brush was scorched in a fire near the Honoapiʻilani Highway and Kuihelani Highway intersection in Māʻalaea on Monday afternoon. The incident was reported at 2:44 p.m. on Monday, Feb. 12, 2018 when reports were received of smoke and flames starting up in the brush on the mauka side of the intersection. Wailuku firefighters responded along with a water tanker and engine company from Kahului. Upon arrival at 2:54 p.m., firefighters found a 50 x 50 foot area of brush on fire around 200 yards west of the intersection. Crews had the brush fire under control by 3:30 p.m. and fully extinguished at 4:18 p.m. The cause of the fire was undetermined. There were no injuries and no structures were threatened.